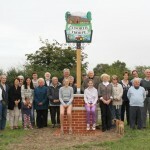 Last weekend saw the unveiling of the new Ixworth Thorpe village sign by a group of residents from Ixworth & Ixworth Thorpe. Many familiar faces in the photos that were sent into the website yesterday. We think the sign looks great and nice to see that the weather held off.